Chronic pain has long been an issue of aging, Although some children and young adults face chronic pain, it is a problem that the vast majority of older adults live with, in varying degrees, daily. With more people surviving to an age where some form of chronic pain is almost guaranteed, the quest for chronic pain treatments has intensified. While many pharmaceutical options abound, the more powerful substances, especially the opium-based products, have left millions with addictions and other health concerns. In 2012, when I started analyzing reports about the health benefits of taiji (tai chi) and qigong from hundreds of taiji and qigong practitioners around the world, I noted that many practitioners reported management of chronic pain among the benefits of practice, and I reported this finding at the Gerontological Society of America Conference in 2014. Since that time, a large number of studies have been conducted on the benefits of taiji and qigong for a wide range of chronic pain conditions, so many in fact, that several scientific reviews have been published on the efficacy of taiji and qigong for chronic pain. Additionally, one can now find an entire chapter on and chronic pain management in the medical school textbook The Essentials of Pain Medicine 4th Edition. I will review many of these findings below. A recent review on taiji for chronic pain conditions was published in Nature’s Scientific Reports. This review pooled several high quality studies and re-crunched the numbers, allowing them to increase confidence in their overall findings on taiji. The researchers were able to review data that spanned a 15 year period from 2000 to 2015, which included more than 1200 study participants with an average age of 61 (± 10 years). Participants in these interventions practiced a wide range of taiji styles. In short, the authors concluded that positive evidence exists for the pain relief benefits of taiji, including osteoarthritis pain and chronic lower back pain, which are among the most common pain conditions for adults from middle-age onward. Evidence on the use of taiji for other forms of pain was limited by the number of quality studies in other areas. The authors also suggested a minimum of 6 weeks for any trial investigating the use of taiji for chronic pain, explaining that the longer the period of a study the stronger the benefits seem to be. In 2013 a review was published on qigong and fibromyalgia, a disorder that involves chronic widespread musculoskeletal pain, fatigue, and sleep problems. Although only 4% of the population between 18 and 65 is thought to be affected by it, this disease is associated with serious physical and psychological impairment, low quality of life and high health-care costs. Some people facing this disease have been prescribed opioid medications, which may provide short-term relief, but typically lead to greater health risks and early mortality long-term. Although there is currently no cure for fibromyalgia and the exact cause is still unknown, many researchers believe it is related to neuro-endocrine dysfunction, and some have considered whether integrative therapies, such as taiji and qigong might be helpful in reducing its symptoms. The 2013 review published by Lauche and colleagues in the journal Evidence-based Complementary and Alternative Medicine concluded that a wealth of “low quality” evidence exists supporting the use of qigong as a potential treatment for fibromyalgia, but that higher quality studies were needed to bring more confidence for the use of qigong with such conditions. Fortunately, more work in this area has been completed, such as a Wang and colleagues (2018) study publish in the British Medical Journal, which shared findings on the effectiveness of taiji intervention for people with fibromyalgia.The study included 226 adults with fibromyalgia. 151 of them were assigned to a Yang style taiji groups, while 75 were assigned to aerobic exercise groups. Some of the taiji groups met once a week and others met twice a week, while all the aerobic groups met twice a week. While researchers were looking for change in fibromyalgia symptoms and associated indicators of physical function, wellbeing and quality of life, the variability in frequency of practice also allowed them to see if the “dose” of made any difference for this condition. Although, the results of the study showed that all treatment groups benefited, the taiji groups reported significantly better outcomes than the aerobic exercise groups, with the greatest benefits for those people in a taiji group that met twice a week for 24 weeks. Benefits included reduction of physical pain and depressive symptoms, as well as improvements in physical function. The authors of the study concluded that taiji is capable of providing similar or better results than exercise, which is the non-drug treatment most commonly prescribed for fibromyalgia and related symptoms. The medical school textbook The Essentials of Pain Medicine 4th Edition includes an entire chapter (61) on the use of taiji for treating chronic pain conditions. This text concludes that not only is taiji a safe and effective approach to achieving a wide range of physical and psychological benefits, high- quality evidence supports the use of taiji for treating osteoarthritis, lower back pain and fibromyalgia. As promising as these findings are, it is important to remember that taiji coaches without medical credentials should not offer treatment or make treatment claims to individuals with specific conditions. Coaches can train individuals in taiji practice and educate them about findings in the literature, but it is important to leave prescriptions to health-care providers. Still, it is a great feeling being able to share in our students’ joy when they find relief from symptoms through their taiji practice! Matthew Komelski teaches courses for the Department of Human Development, Virginia Polytechnic Institute and State University. Blacksburg, Virginia, where he recieved a Ph.D. in Human Development. 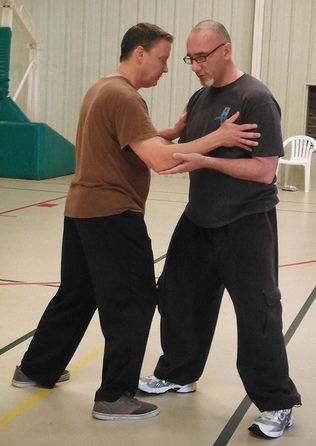 He is an avid researcher in his teaching areas, and teaches a variety of martial arts classes. Matt was on the committee that planned the content areas for this newsletter 12 years ago. Reporting research regarding taiji and qigong was one of 3 research priorities identified. Matt has been the leading author in this area since the newsletter's inception.